← MY . . . MY . . . MY! Those of us who have placed our trust in Jesus Christ’s atoning work on our behalf must be careful and not think that this amazing, gracious salvation is all about “me.” To be sure, we were saved individually . . . BUT we were saved to community. 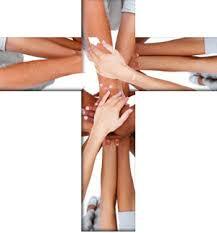 Every Christian believer is part of one body with many members, in which each person is needed and valuable. And as members of this one body, you and I have received instructions for how we are to treat one another. One of the distinguishing marks of the early church that caught the eye of the watching world was the way the Christians “one anothered” each other. They continually devoted themselves to meeting others in their place of need. The Gospel truths helped them rise above the natural sinful human tendencies for avarice and self-protection. Instead, they lived lives marked by self-sacrifice, regardless of the cost or circumstance. Can the same be said about you and me? What would those closest to us say about the visible evidences of self-sacrifice in our lives right now? Here is what we must keep in view. We love because He first loved us. We forgive because He first forgave us. And we “one another” because He first one anothered us! Are there people in your life you find hard to love? Love them anyway! Are there people in your life you simply cannot bring yourself to forgive? Forgive them anyway! Are there people in your life you find difficult to “one another”? One another them anyway! You see, the key to “one anothering” is to fix our hearts on the One who, in spite of our sin, one anothered us. When we keep God’s mercy in our hearts and His love in our lives, how can we not be merciful and loving in the lives of others? Jesus took our place on the cross and paid the penalty for our sins . . . all our sins—past, present, and still to come. And don’t forget this: while He hung, bleeding and dying on that cruel cross, Jesus cried out to His Father in heaven, “Father, forgive them, for they know not what they do” (Luke 23:34 KJV). That truth—that amazing love and grace—should set us free to put others first and lay our lives down for others. These are the marks of the Christian. This is the foundation upon which a life of “one anothering” is to be built.